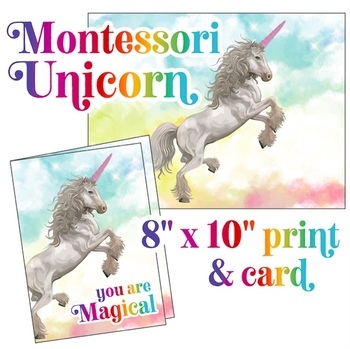 I've always believed the Montessori Method is a true unicorn when it comes to education, and now that my children are in a Montessori school I *know* that Montessori teachers are the most magical of all! This piece is the perfect gift for the Montessori teacher with a quirky sense of humor. Print as many times as you'd like! Gift this to ALL of the amazing Montessori teachers and guides and directresses in your life, year after year after year! Are you the director of a Montessori school? Print these for all of your amazing teachers! 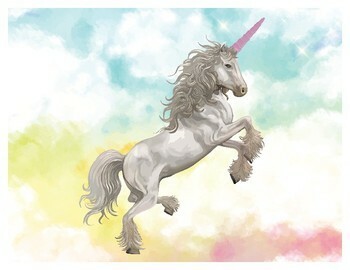 An 8" x 10" printable of the Montessori unicorn with the Pink Tower as her alicorn against the background of a rainbow colored cloudy sky. I know, this is the art piece you've been waiting for all these years. Me, too. 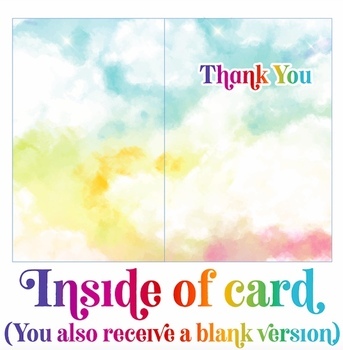 This prints on regular letter-sized paper. Print at full size to make sure the background is the full 8" x 10" if you plan to frame your print! D I G I T A L * F I L E * O N L Y ! Upon purchasing this listing, you will receive high-resolution PDF files intended to be printed on letter-size (8.5" x 11") paper. These files come in a ZIP folder. Let's be friends on Instagram! I love seeing my designs in action, and I post lots of sales, freebies, and process updates over there. If you used this material, please leave feedback. I can't wait to hear what you think! This design was created by Lori Oster, head designer at Interlude Design Studio, a division of Luftmensch Designs. Copyright © Lori Oster. All rights reserved by author. This product is to be used by the original downloader only. Copying for more than one teacher, classroom, department, school, or school system is prohibited. This product may not be distributed or displayed digitally for public view. Failure to comply is a copyright infringement and a violation of the Digital Millennium Copyright Act (DMCA). Clipart and elements found in this PDF are copyrighted and cannot be extracted and used outside of this file without permission or license. Intended for classroom and personal use ONLY.